The Élysée Accord was signed on January 22, 1963. This date now symbolises the friendship between Germany and France. Every year the students of the German and French schools get together on this day, allowing the French students to get to know the Ernst-Reuter School and the German students to experience the Lycée Charles de Gaulle. 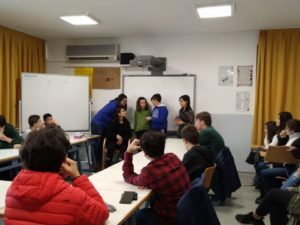 This year the ERS hosted the French students on January 22, 2019. We greeted the French students with a German-French-Turkish breakfast in our cafeteria, ‘The Lunchbox’, which served up croissants, pancakes, cheese and fresh vegetables. This gave the students a chance to get to know each other. After this all the students, the two teachers from the Lycée, Frau Paradzik, who teaches French at the ERS and also organised the affair, and Dr. Bauer, the principal pro tem, gathered to take a group photo in the schoolyard. Afterwards all the students convened in a classroom, where Dr. Bauer held a speech. He emphasised the importance of the friendship between Germany and France, as these two countries form the heartland of Europe. Thus the relationship and friendship of these nations is doubly important. Following Dr. Bauer’s speech the star singers of the first four grades came and sang songs. Then the students played Taboo. The French-speaking IB students prepared the cards for the game, which the students of the Lycée won. 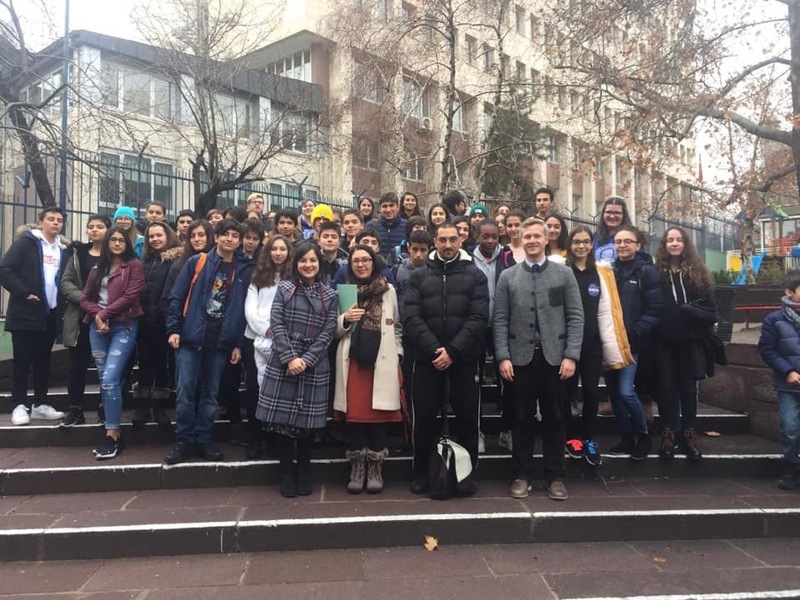 After this the students wrote some brief essays, which reflected the views about the friendship between Germany and France, as well as the German-French day in Ankara. These commentaries produced a larger picture, which will permanently remind us of this special day. 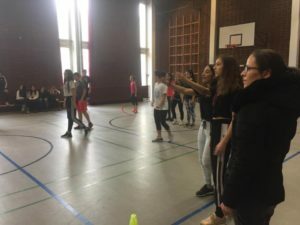 Finally, the students all participated in various ball games, such as dodge ball and football under the supervision of our sports teacher Frau Erçakmak and her counterpart from the French school. This annual meeting reflects the importance of the friendship between Germany and France and proves that the Germans and the French can get along very well.